For almost thirty years, Country Music Hall of Fame members The Oak Ridge Boys have been a part of their fans' holiday seasons with their annual Christmas tour. This year, the Grammy Award-winning group will play their Shine The Light On Christmas show at the Budweiser Events Center at The Ranch in Loveland on December 16. Oaks’ lead singer, Duane Allen, says, “Christmas is my favorite time of year. I love the positive things about the season.... the joy, happiness, giving, sharing, time with family, and gifts. The beautiful lights and decorations. Christmas music. Special food. And most of all the true meaning, which, of course, is celebrating the birth of our Lord and Savior, Jesus Christ. Known for their iconic and multi-platinum selling hit “Elvira,” along with other chart-toppers like “Bobbie Sue,” “Thank God For Kids,” and “Leaving Louisiana In The Broad Daylight,” The Oak Ridge Boys have achieved a decorated career, winning five GRAMMY® Awards, and multiple CMA, ACM and Dove Awards for their cross-over brand of pop, country and gospel music that spans multiple generations. Made up of members Duane Allen, Joe Bonsall, William Lee Golden and Richard Sterban, whose unmistakable bass on the lyric “oom poppa, mow mow,” has become one of music’s most recognized sing-alongs on an international scale, The Oak Ridge Boys are members of the Grand Ole Opry and achieved arguably country music’s highest honor in October 2015 when they were inducted into the Country Music Hall Of Fame. 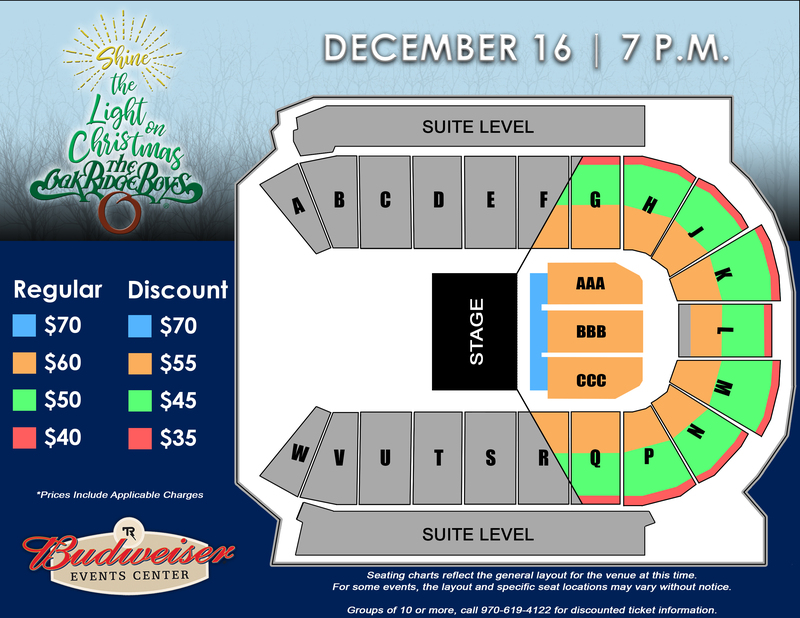 Tickets, priced at $39, $49, $59, and $69, go on sale Friday, June 15 at 10 a.m. and can be purchased at www.BudweiserEventsCenter.com, the Budweiser Events Center Box office or call 1-877-544-TIXX. Groups of 10 or more can call 970-619-4122 for more information on group discount rates. 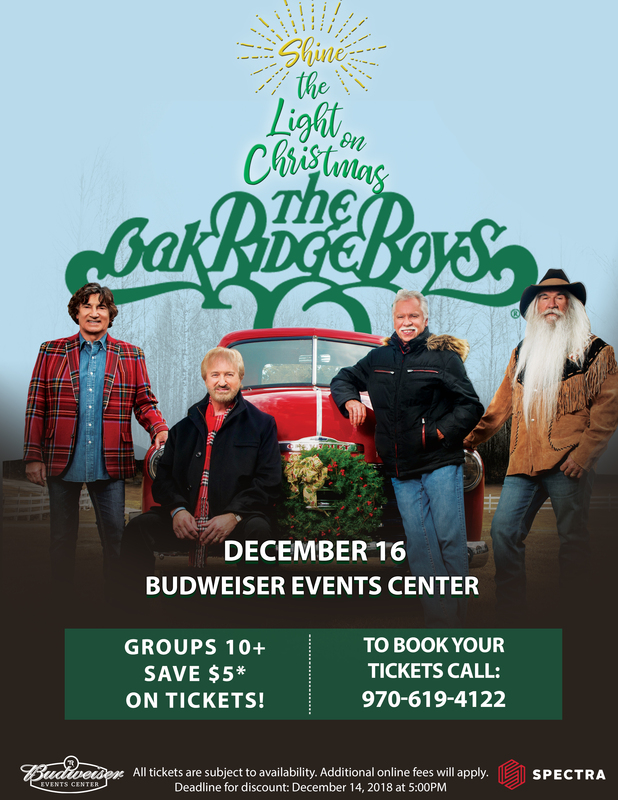 Groups of 10 or more can save $5 on tickets to The Oak Ridge Boys' Christmas Celebration Tour!